I got this recipe from a news paper cutting, collected when I was studying college. Usually I don’t prepare this because my hubby doesn’t like this type of subzi for rotis. He always needs a gravy to go with rotis. So while preparing Dum aloo I took half of the prepared dish and added cashew paste to make it a gravy. Even then I couldn’t bring it to gravy consistency. So he didn’t like it. But who cares? I loved it. He had some tomato gravy for his rotis. I really enjoyed it from morning till evening. It is very easy to prepare. The toughest part is the peeling of baby potatoes. If some one is there to help you with this, then the dish takes a little time for preparation. As i didn’t have saunf powder, I added 1tsp of saunf to oil. And I added the normal red chilly powder. 1. Grind cashew to a fine paste. 2. Boil water and add the baby potatoes. When cooked remove from water, peel and prick all sides with a tooth pick. 3. Deep fry the potatoes till dark brown in colour and keep aside. 4. In a pan heat 3tbs oil. Add cloves and fennel seeds. When splutters add the beaten curd. 5. Add all the masala powders and cashew paste. Saute till oil is seperated. 6. Add the potatoes and water. when it starts boiling switch flame to low and cover the pan. 7. Cook till all the water evaporates. 8. Transfer to a serving dish . 9. Serve hot with rotis. wow..this recipe does not make use of tomatoes..good one. will try. thanks for sharing teh recipe. Slurp, such a droolworthy dum aloo, absolutely irresistible.. Pass me the plate Gayathri…..I am drooling. Gayathri, I’m drooling here..looks very very delicious..
Looks SO good! Been a long time since I had this…. baby potatoes taste very good…looking beautiful.. This is my favourite, looks very delicious. Kashmiri dum aloo looks delicious. Delicious curry! have some baby potatoes in hand..will try it soon. I love this curry..very nicely done! such a lovely recipe…creamy and rich. 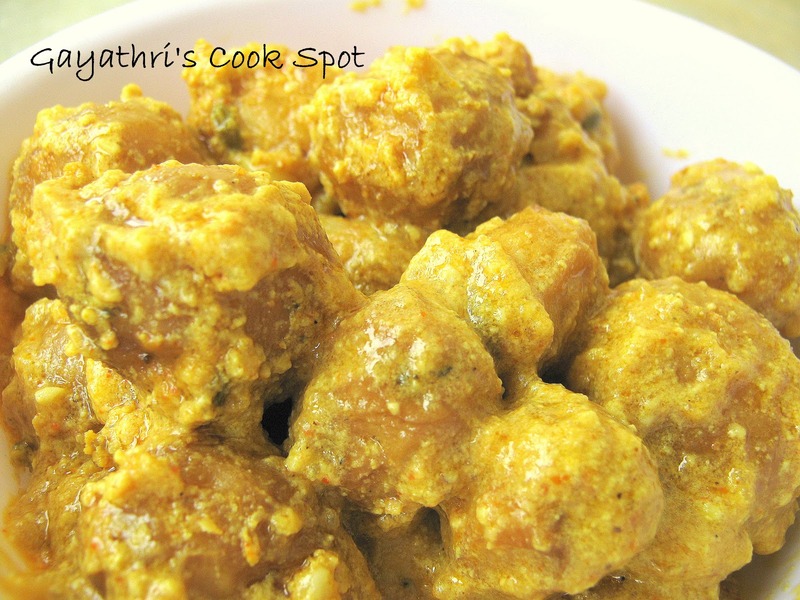 This is a yummy yet simple recipe of dum aloo,love this recipe! Looks so good Gayathri,yummy and easy to make.